The historical importance of the Artemision of Amarynthos mainly derives from the chapter that Strabo dedicated to the island of Euboea in the tenth book of his Geography (X 1, 1-13). The sanctuary hosted important public documents, among which a law regulating the annual procession from Eretria to Amarynthos. This ceremony took the form of a military parade composed of 3,000 heavily-armed warriors (hoplitai), 600 cavalrymen (hippeis), and 60 war chariots (harmata). These contingents may be related to an underlying, sophisticated political structure, perhaps linked in some way to the distribution of the Eretrian civic body into six tribes (phylai) starting c. 500 BCE (roughly at the time Athens instituted its ten tribes). Possibly, each tribe provided 500 infantrymen, 100 cavalrymen, and 10 war chariots. A second document recorded by Strabo is the military agreement between the rival cities of Chalkis and Eretria, supposedly banning the use of missiles, a treaty that has most often been associated with the semi-mythical Lelantine War. The function of epiphanestatos topos ‒a privileged place for displaying the deeds of the Eretrieôn polis‒ has been confirmed by several epigraphic discoveries made since the 19th century CE. 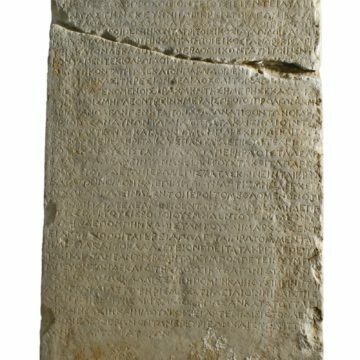 A treaty between Eretria and Histiaia in northern Euboea dated to 400 BCE discloses that the Eretrian copy of the decree shall be displayed in Amarynthos (IG XII 9, 188). 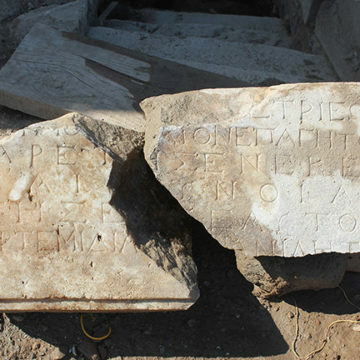 Another treaty between Eretria and Styra was found during the 2017 excavation at Amarynthos. 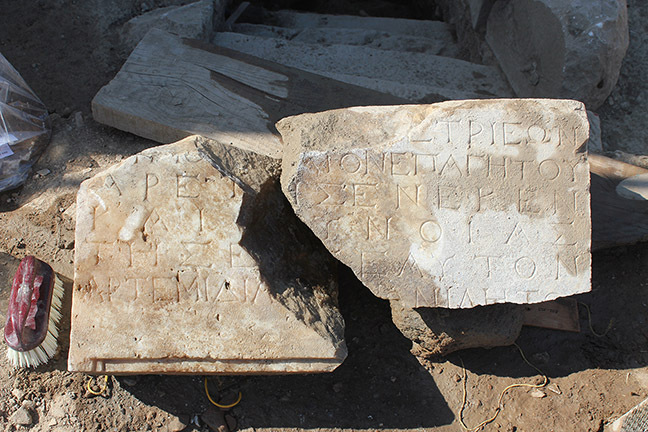 This 40-line inscription dated to the last decade of the 5th century BCE sets the terms of inclusion of the small neighbouring town of Styra into the large polis of Eretria. 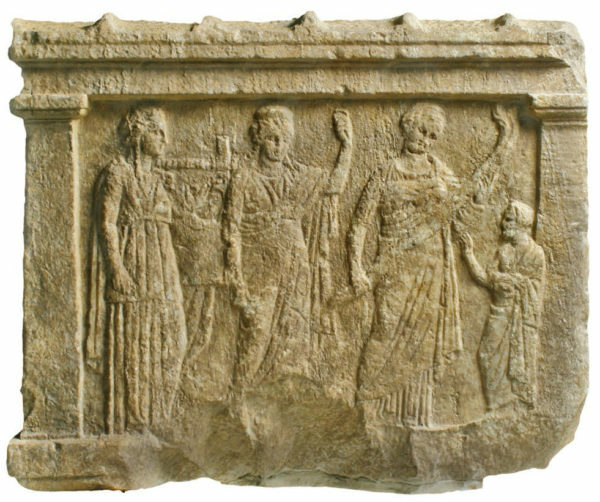 2th century BCE honorific decrees attest that benefactors of the polis were memorialised by the dedication of two bronze statues, one erected in the city Gymnasium and one in the Artemision. During the same period, an effigy of Artemis Amarysia appears on the obverse of Eretrian tetradrachms and octobols. The political role played by this deity is attested in other texts and documents. 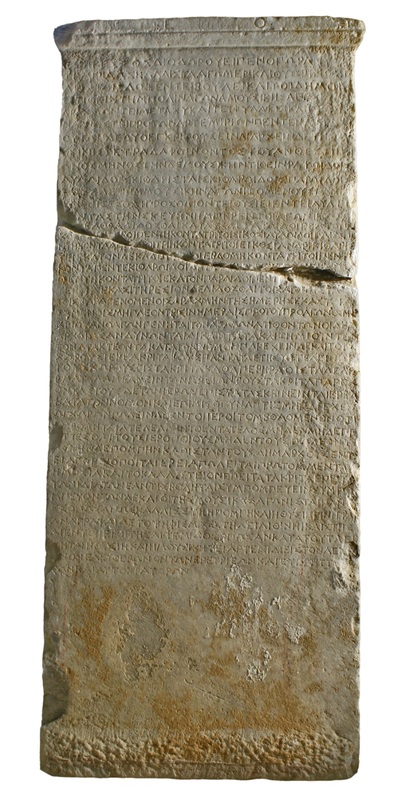 Among the most significant is a stele, displayed in the sanctuary (ἐν τῶι ἱερῶι τῆς Ἀρτέμιδος), which established and regulated a new competition intended to enhance the splendour of the Artemisia festival (IG XII 9, 189). The deity is concurrently designated as Metaxy (‘the One of the Middle’) and Phylake (‘the Watch and Guard’). It refers to the period of civil strife (stasis) that, for several years, tore the polis of Eretria apart and threatened its existence. Artemis, however, remaining above the fray, ensured the salvation of its people. 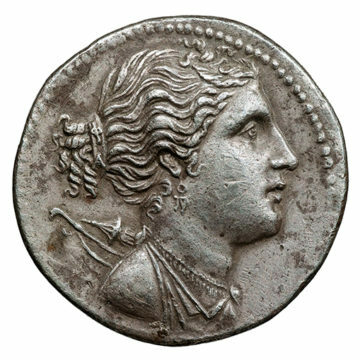 Consequently, once liberated from tyranny and recovering their former prosperity, the Eretrians expressed their appreciation to Artemis by establishing a musical competition, thus celebrating her guardianship through poetic and instrumental events (including prizes of money likely to attract numerous competitors). 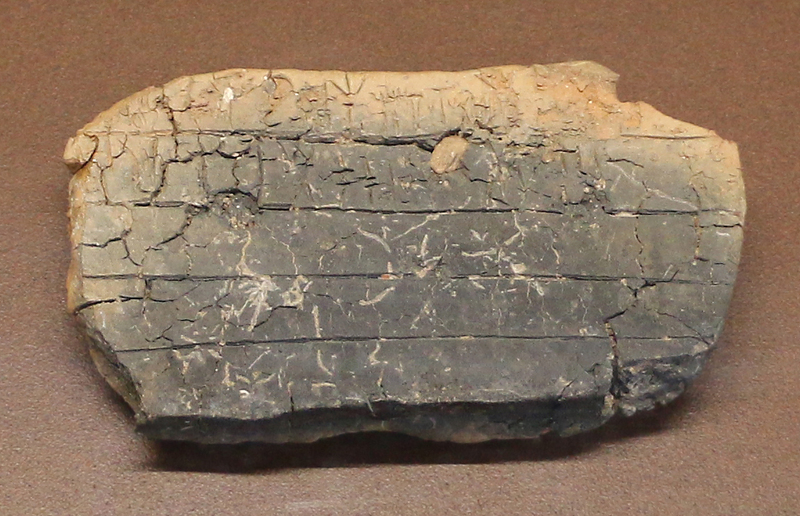 Another 4th-century BCE inscription, the Eretrian Law against Tyranny and Oligarchy (SEG 51, 1105), brings to light an otherwise unattested feature of the Artemisia and confirms the sanctuary’s political importance. This law stipulates that the opponents of the democratic regime will be under a solemn curse, which will be pronounced annually by all priests and priestesses during the two major festivals, the Dionysia celebrated in the city and the Artemisia in Amarynthos. The text also stipulates that the tithe on the confiscation of property belonging to citizens sentenced to death or exile will be directed to Artemis Amarysia. This clause establishes Artemis’ treasury as Eretria’s most important sacred fund. Ranked first in the Eretrian pantheon, alongside her brother Apollo Daphnephoros (patron deity of the main urban shrine), Artemis Amarysia was also venerated beyond Eretrian borders. In Attica, an Amarysion is attested in the deme of Athmonon, north of Athens (the modern name, Maroussi, derives from this yet unlocated shrine). 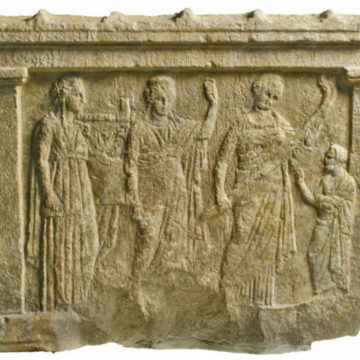 Pausanias understood that the origin of this festival was to be found ‘in Amarynthos where the Euboeans still worship Artemis Amarysia’ (1.32.5). If Pausanias mentions the Euboeans and not specifically the Eretrians, it is because he was probably aware of the Paneuboic dimension of the Artemisia. Indeed, Livy (35.38.3, drawing on a passage in Polybios) asserts that people from Chalkis and Karystos joined the Eretrians in Amarynthos for the annual celebration of the goddess (sacrum anniversarium Amarynthidis Dianae), a testimony confirmed by an inscription from Karystos. Therefore, in all likelihood, the Artemision was Euboea’s most renowned shrine. Consequently, it is not unreasonable to believe that it enjoyed the status of a koinon hieron ‒a sanctuary common to the whole Euboean ethnos‒ at the beginning of the fourth century BCE at the latest, when the first attempts towards a Euboean federal union were made. 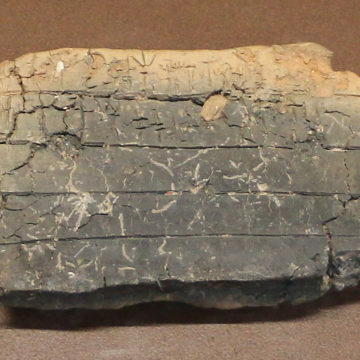 The cult itself must be, however, much older, extending back to the Geometric, and perhaps even to the Mycenaean period, when the name Amarynthos (a-ma-ru-to) appears on the Linear B tablet TH Of 25 and on one of the inscribed sealings from the Theban Kadmeia. Last, it is important to stress that Artemis was celebrated in Amarynthos along with other deities, such as the Eretrian hero Narkittos/Narcissus, Amarynthos’ son according to an old local tradition.